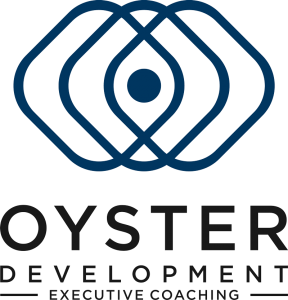 Oyster Development and People and Performance recently co-hosted a one-day experiential workshop at Ashridge Business School, facilitated by Dr Alison Hodge. These are my personal notes and reflections of the workshop gathered into some order and themes. Contracting is a deliberate process of building trustworthiness and safety amongst people working together. In this context, we are talking about the collective work of a coach and a team or group. Participants in a team activity come with many different expectations, anxieties, hopes and excitement. Those will predispose the members to contribute in certain ways. 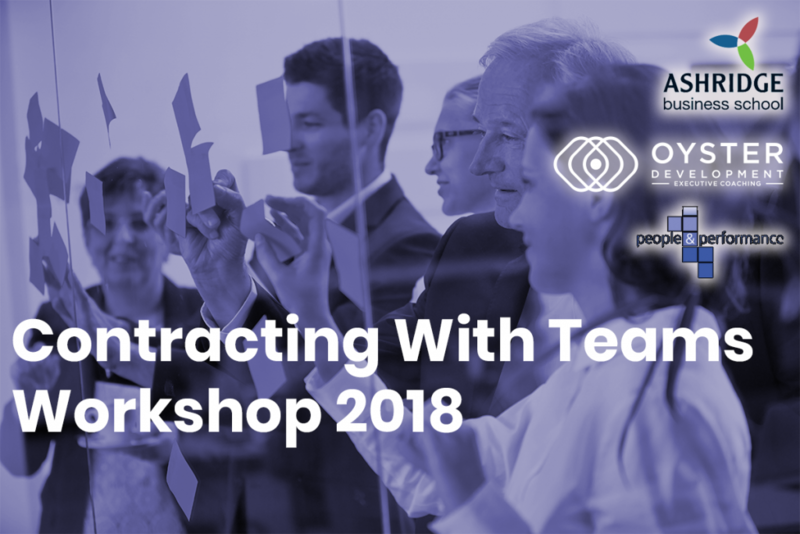 The purpose of contracting at the start is to create an environment where each member can bring their most creative and useful self to the service of the team at that moment. It sets the ground for any work that comes later. The inquiry to the members is – what do you need for us to be able to move forward usefully? This workshop explores how we as coaches sit with that and hold it as each participant engages with it? How come it’s necessary? Well, how do you know how you can move forward together if you don’t know how you’re agreeing to work together? Having a method that deliberately addresses ground rules, like confidentiality, reduces the chances of having to back up and do it later, when the (unspoken) ‘rules’ are broken. Contracting for teams starts way before the members come together. Even before you turn up, expectations and assumptions form ideas about how each is going to participate and contribute. But more of that later. We were invited to write these onto post-its and stick them to two boards. Expressing them this way, rather than speaking them into the group, makes it safer to disclose them. Less experienced groups might still be self-conscious to use even this method of expression. This exercise revealed how the needs and expectations of participants can be contrasting or conflicting. For example, someone wrote ‘I assume that the contents of the session will be confidential.’ But if you are working with a leadership team, whose members will need to implement the outcomes of the teamworking in their parts of the organisation, it can’t all be kept confidential. Also, how does that blanket request for confidentiality tally with my intention to write an article about it (which I declared at the time)? So how do you decide, up front, what is and what isn’t kept confidential? 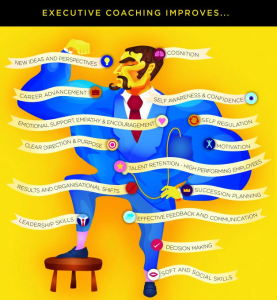 How do power, hierarchy and corporate knowledge effect teams? Voicing your needs can be hard in the face of hierarchy and power. This makes it hard to get your own needs met. If a team member doesn’t feel safe enough to contribute, they will withhold their contribution and the team performance will be diminished. The coach has the task of creating and holding a space that allows for safety. But each member will respond to that space according to their own valence and what they bring into the room with them. Recognising the presence and role of power and hierarchy can help those members to come more into the process. But this isn’t just an exercise in reassurance. Trust will need to be tested before it can be relied upon. So, there is a joint responsibility; for individuals to get their own needs met as best they can, and for the group and the coach to create conditions for each to be able to get their needs met ‘well enough’, in service of moving forward usefully. Participants will only get met if they speak for themselves rather than in the abstract or ‘when we’ or ‘when you’. It’s their own experience that matters. The coach can encourage (insist) that participants to speak from the ‘I’. That also requires some courage (I just noticed that’s what ‘encourage’ means. Discussions can easily drift into the abstract, addressing things that are not in the room. They can also be taking place inside people’s heads. For effective contracting we should pay attention to how the team is working in the here-and-now? Notice the process. The coach can help bring the here-and-now into the room. For example, help the participants to stop ‘gauging what is going on’ and mind-reading each other. Explicitly find out what’s going on for other participants. Get all the voices into the room – quieten the projections and mind reading. If you feel that this might be too exposing and cause discomfort, remember that it’s hugely disempowering to protect and rescue others. Find the balance between creating a safe space and having the team members get their own needs met. After all, they turned up. So they must have a reason. A person can shift their patterns of behaviour by gaining awareness of them and being intentional about how they respond and behave. It’s a challenge to know how we invite teams to do that without shaming and with creativity. We can model our openness and honesty to encourage theirs. This is made easier by finding ways to help participants to say something about themselves that they wouldn’t otherwise have shared. Using a projection exercise can achieve this; like asking them to choose a picture card and then asking them to introduce themselves using the card as a reference. This also reduces the competition tendency – the ‘credentialing’. Attention on the team or on its members? 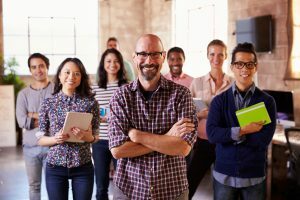 When do you work with the team and when with the ‘components’ (members)? The team is the client; each contributor makes the team. The group needs to have a harmonizer, a withdrawer, a dominator, an encourager, a dramatizer, a disagree-er, an information giver, a question asker, etc. Don’t draw conclusions too early about what’s going on in the group. As a facilitator, give yourself time to notice. Keep a view of what’s happening in the team as a whole, rather than what’s happening with Diego, Luke or Heidi. We all learn at the edges of our discomfort. Try to notice who in the team is at full stretch and what credit they are getting for that. Boundary holding is a very important element in contracting (such as keeping to time). This is because it’s a way for people to see that you know what you’re doing, and it builds safety. Checks the groups’ energy levels by checking-in and re-contracting. We each have different energy levels (it doesn’t mean that you’re a bad facilitator). When energy is low, change the energy. Perhaps take a step back and have the members ‘look into the group’, to see what’s going on for themselves and share their observations (this works well if they are standing up behind their chair). How do people respond to my interventions? However it is, it’s OK. It’s data. How do we handle the fear we feel if we pick up animosity which might be a projection or a displacement from a feeling that can’t be directed toward the intended recipient? Do it from a ‘being present’ place, rather than an ‘expert’ place. It’s unlikely to be ‘your stuff’. Personal responsibility needs to be taken for the patterns that each person brings into groups. But to know if it is your stuff or not, you should have enough self-knowledge to know what patterns you, as coach, bring into groups and how do they show up? You also have power in your role as coach. You need to be intentional about when to be challenging and how you decide when to use that power? Have a structure to your approach. But try to maintain the tension between structure and emergence. Let the here-and-now happen. In most corporate structures individuals are seen through the lens of their function or professional persona, rather than as an individual human. Individuals might harbour fears of exclusion, judgment and rejection by their team if they show too much of themselves and their vulnerability. These fears are usually justified, at least in part, and they will show up in your work with the team. ‘Human’ roles are important in a team. The client team needs, and will create, all the roles it needs (see ‘Attention on the team or on its members?’ earlier). In generating human relationships, we need to distinguish ourselves and in groups this can be done through the roles that we (subconsciously) take on, on behalf of the group. The coach also attends to the human-ness of the participants when inviting them to show up in some different way (by using the picture cards in our case) and by acknowledging that power exists in the team and having the team give attention to that. 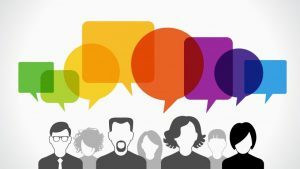 How and when do you start to engage with members? What’s going on for them ahead of time? What has made it ok for them to turn up on the day? What environmental factors and vested interests contribute to that? Get the team thinking about it before they turn up – prepare the ground – stir the pot – or you’re missing an opportunity. Reach out to them some time before you meet to work. Trigger their thinking. This will raise their awareness of how they, as participants, are showing up and how honest they can dare to be? Pre-contracting – involve the leader in the pre-work discussions and get their explicit buy-in to the way in which you work. If they don’t, don’t accept the work. If they agree and then still thump the desk, quietly remind them that this is what they are paying you for. Authority – Yours. Have some and bring it. You know this stuff works. Don’t be put off by others’ discomfort. If necessary, briefly explain to them why it’s valuable to look at process.